On the thread where member's neighbor complaining about the smoke created, we all advised him not to use newspaper to start the chimney as it creates lot of smoke. AZ Monsoon suggested using 2 chimney to cut down the smoke time. Well, I agree in time reduction but the smoke would be twice as much is what I am thinking. Anyways, I had other ideas. I thought using 2 chimney would be great idea to do an experiment to see which chimney would light faster or less smoke produced with different setup. Normally, I fire up one 3/4 to full charcoal chimney using either my performer propane assist or my Gas side burner to start up. I started using BBQ Dragon to cut down on the time. And that is fine but got very curious about not only time but less or no smoke factor. So, today's first experiment was to divide same amount into each chimney. #1 chimney- I put 2 weber starting cube and put charcoal on top to compare to how I normally do it with full charcoal. Started up in my side burner. Not much smoke compare to normal full charcoal. 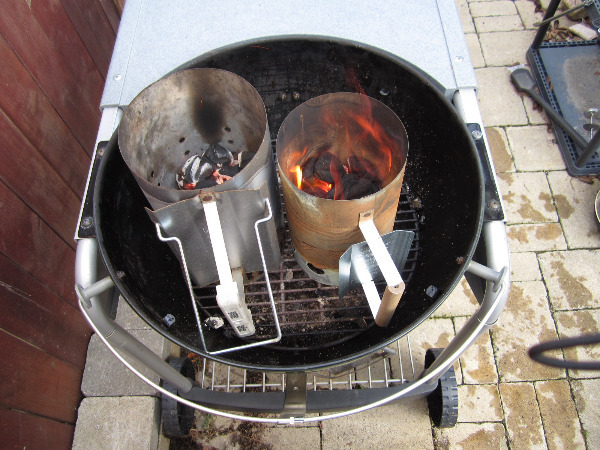 #2 chimney- I measured out exact amount of charcoal in a separate bowl and doused it with starting fluid for few min. in the name of science experiment. Then into the chimney with quick shot of more fluid before starting up in my performer gas assist. Holy Crap! it takes no time to get ready. You all know when full chimney is ready about 20 min. when you see no more smoke and you see light orange or redish flame come up and the top is starting to ash over. Well. big flame from start to the end but no visible smoke at all. And it is done in no time. Using my bbq dragon for only 1 min. as I thought it was all ready to dump into the basket. All ready to go in 10 min. Normally, to ash over fully like this would take lot longer. -using 2 separate chimney cuts down on time not in 1/2 but more like to 1/3. 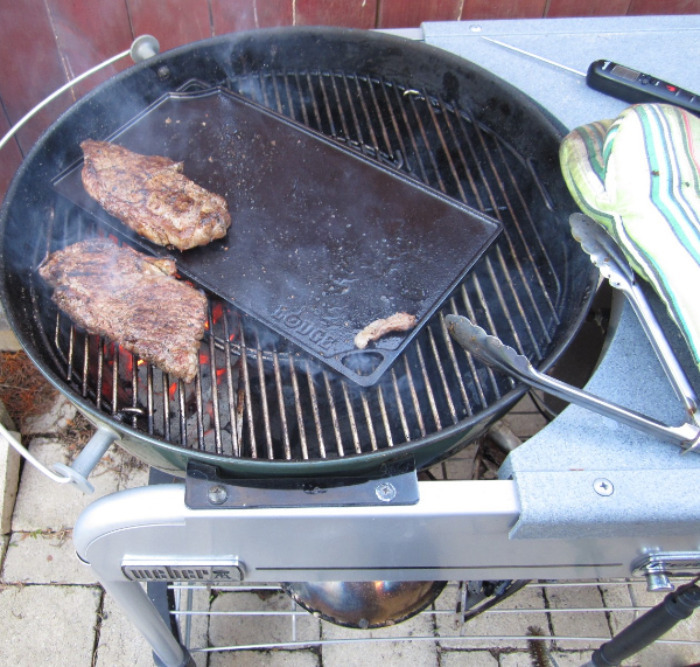 also, seems to produce less smoke on the #1 chimney to about 1/3 or less. Don't take my word. Do your own easy experiment and see what you think. - using lighter fluid cuts down on time big time( less than 1/2 of #1 chimney) and produces no visible smoke at all, just a big flame. No difference in taste on steaks I did as I never poured it directly into the kettle or let charcoal soak enough to penetrate fully. Thanks for taking the time to do the experiment. I'm going to try a few out for myself. 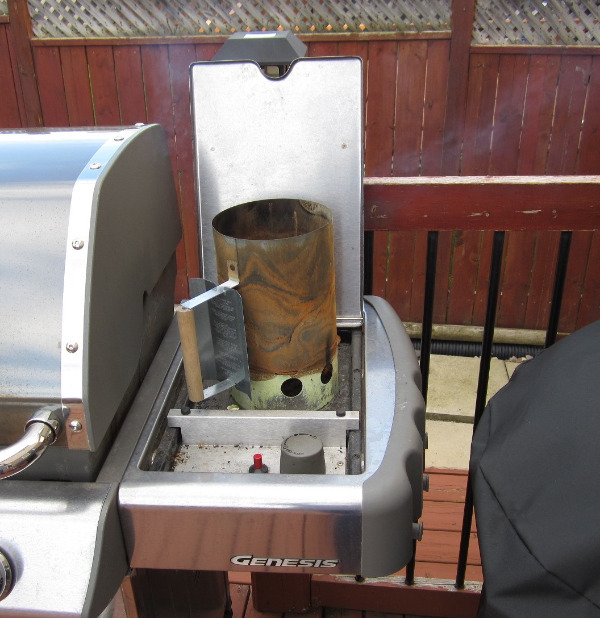 I've used Matchlight in the chimney bottom with normal charcoal filling the rest on my performer burner which works and less smoke. The best thing for me seems when I use a small chimney full on the burner. Everything gets lit up quickly and no smoldering. Great work, thanks for the experiment! After this simple experiment, I think the key to less or almost no smoke is to light up charcoal quickly so as not to give time to smolder like blksabbath mentioned. There is definite coordination between quick start up and less smoke produced. Splitting charcoal into 2 chimney ( I think with less charcoal with more air circulation with burner not too far from the top layer charcoal is the key to starting up fast), mixing weber starting cube into charcoal, and using starting fluid ( make sure not to pour directly into the kettle) all seems to aid in this process. Especially the #2 chimney engulfed in flame for the whole duration did not smoke at all and was ready the fastest. 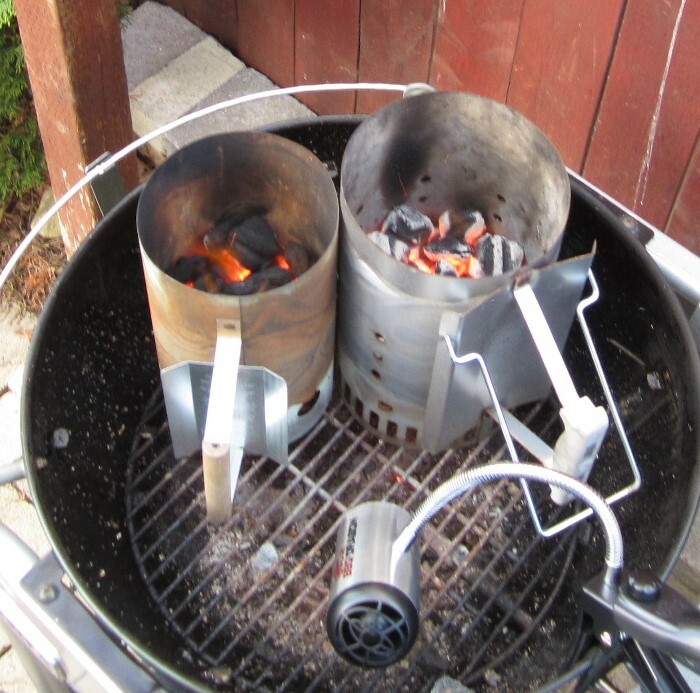 I encourage others who are interest to try out your own experiment with 2 weber chimney starter to see your own finding. Funny, I could have swore that in my lighter fluid days I had much less smoke on startup but its been a long time since I have used it. I started a similar thread some time ago about the neighbors & chimney smoking out the neighborhood. I think I figured out what I was doing wrong.. I was using way too much newspaper and had it all tightly bunched up. I reduced the amount used (1-2 sheets) and it produces far less smoke and lights up just as quick (ready to go in 15-20 mins.. not bad considering I'm doing prep work). Thanks for taking the time to experiment, this helps me out! I'm going to try the lighter fluid/chimney setup and see how that goes. You are correct! For any comparison test to be fair, I should have used exact same ones. 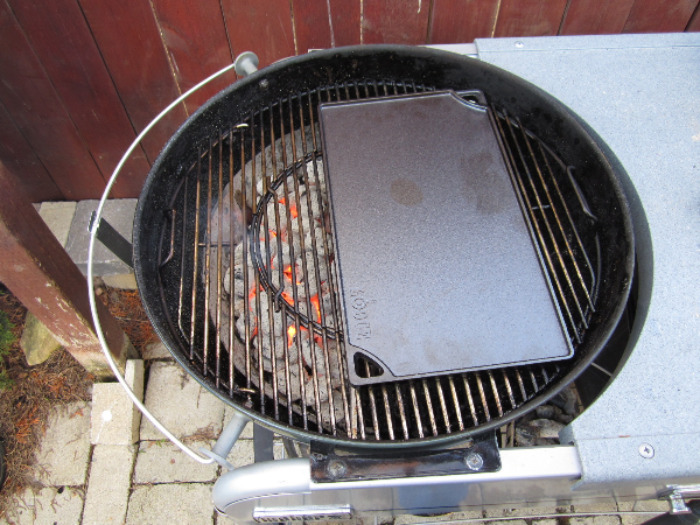 I should have used my other spare weber chimney. But, for this particular test, I grabbed different chimney without thinking as I wasn't comparing #1 directly to #2 chimney. Sort of 2 different experiment in one and maybe subconsciously wanted to distinguish #1 from #2 subject by using different chimney. Forgive my wrong doing. Oh! lighter fluid is another one I forgot to mention in any detail. From all the kettle scores last year, I ended up with about 7 full bottles of lighter fluids from many different sellers. They sat in my shed till now. I do not condone using lighter fluid or use it myself. 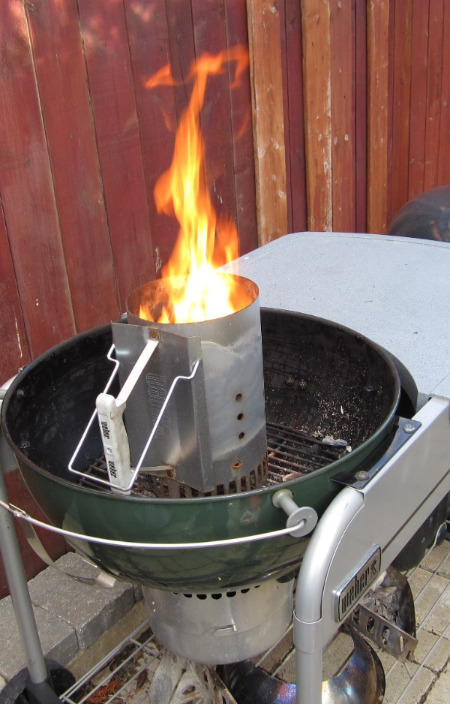 But for this test, in theory and in practice, if you get lighter fluid all burned out of charcoal before dumping into charcoal basket for cook.... it might not be bad especially for members wanting to shorten starting time and almost no smoke produced situation. You just have to think outside the box and try few things to see if it actually work or not.